Lay like an emerald jewel in the Western Aegean Sea, Skopelos is one of the most beautiful islands in Greece. Such is the immense natural beautiful of the island that is was propelled to fame as the location of the Hollywood movie Mamma Mia. Much of Skopelos’ beauty is owed to its pretty beaches, gently lapped by crystal clear water and backed by verdant foliage that clings to the hillsides. 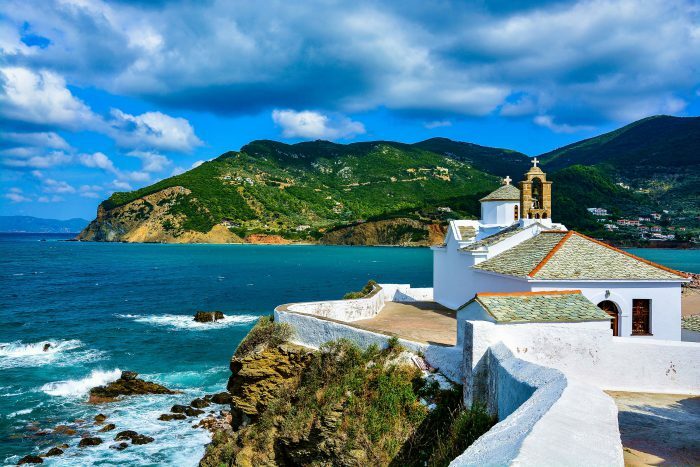 If you’re planning a holiday to this remarkably picturesque Greek island and wondering which beaches to put on your itinerary, take a look at the following three best beaches to settle down for the day on Skopelos. Stafilos is one of the closest beaches to the island’s capital of Skopelos Town. Pretty wooden steps lead down to this beautiful pebbled bay that’s gently caressed by the incredibly clear Aegean Sea. Stafilos Bay is named after the Minoan king, King Stafilos, who is believed to have come ashore from his boat at this attractive cove. With a tranquil ambiance and translucent water, Hovolo is regularly rated amongst the most beautiful beaches on Skopelos. This pretty beach can be found on the western side of the island and comprises of three coves, each as attractive as the others. The coves are flanked by large rocks that tumble to the water’s edge. There’s little in the way of facilities at Hovolo, just peace, tranquillity and intense natural beauty – the perfect spot to lay your towel down for the day and truly unwind. Panormas Beach stretches for 600 metres and boasts fantastic views of the island. This sandy beach is located on the north coast of the island, 14km from the town of Chora. The beach has a relaxed atmosphere and plenty of facilities, including sunbeds and changing rooms, to ensure visitors have a comfortable stay.